Shades of Love. An Anthology of Short stories. I am not a big fan of love stories. Sometimes it’s too sweet to be true and I try and keep my hands off books , that claim to be an out and out romantic story. Come on, I can’t read pages and pages of all what some people claim to be unconditional love. When I came across this book, Shades Of Love, I presumed it to be another one of its kind. But then I happened to notice another line that said “An Anthology of short stories”. I like reading short stories, thanks to a lot of bloggers (my favorite short story writer is Partha Sir, who blogs here ). So I decided to go for it and read it. 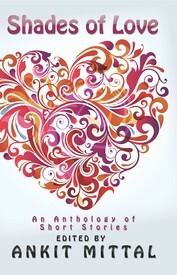 Shades of Love, comprises of stories written by twenty five different people. The profile of the contributors include IT professionals, management graduates, students, journalists, architects, writers, teachers, dancers and people from the field of medicine. Before reading the book, I read the short note about each contributor and I was surprised by how people from such diverse backgrounds nurtured the spirit of writing despite their mainstream profession. Kudos to the Editor Ankit Mittal for such a nice initiative and a wonderful compilation of stories. As for the book, It was very good and much more than what I had expected it to be. The most striking aspect of the book was that, despite having a common theme, no two stories were the same. Each was different in its own way. Some were good, some were exceedingly good. It covered almost every aspect of life. Not even once did I have to turn back to check if there was a similar story narrated earlier in the same book. The advantage of having so many different writers on board was, the stories were all fresh, from very new perspectives. Not the age old stories delivered with a new touch. To specifically mention a few stories that stood apart, I loved Sachin Garg’s ‘The Remedy’ and Shubham Choudhary’s ‘He was there!’. Of the many stories that I read, these two stories were really close to my heart. The way they were written, the idea behind that story, all in all, was wonderful to read. And though many other stories deserve a special mention, among those was one story which took a dig at F.R.I.E.N.D.S. And being a great fan of the series, I just couldn’t let myself continue on with the rest of the story, though even that story was good, till the point I’d read. On the whole, I liked the book. The short stories were definitely ‘moving’, as the book says. Its always nice to have a series of different stories on a common concept that have one looong story on the same concept. As you pointed out, its refreshing and different. And nice name too “Shades of Love” which goes along with the short story concept. 🙂 All i will say is Good review. We saw your blog and instantly loved it. And we wish to invite you to FirstQuarto. We sincerely apologize to contact you in such manner but we couldn't locate your email-id. Hope you take it in good spirits. Yes, It's nice to read these short stories once in a while, that too from so many different people!